This is a sponsored post. 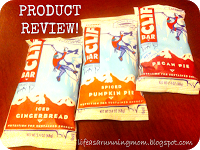 I received three seasonal flavored bars from Clif Bar to try and review. I am receiving no further compensation for this post. The opinions expressed are solely my own and I did not promise a favorable review. I do not turn to bars on a regular basis. I prefer making my own snacks and meals but in reality, sometimes a running mom just needs to grab something on the go that is quick and easy. I was happy to hear that Clif Bar makes some dairy free bars. Now there is a note on the package that it may contain traces of milk so if you have a true allergy, you are warned. I received the bars in October and with the end of year holidays just around the corner the flavors were indeed seasonal: Iced Gingerbread, Spiced Pumpkin Pie, and Pecan Pie. I was excited to give them a try even though I am not a pie lover. I think it is the crust that I am not 100% keen on but still, the flavors sounded wonderful! Next I moved on to Pecan Pie. Now that would be a good pie! I may avoid the crust but ooey gooey pecan wonderfulness is hard to resist! Who could ask for more? Will I eat a piece? Probably not. Way to ooey gooey to do my body again good. The Clif Bar - I loved! Not as ooey gooey but I am sure it doesn't pack on as many empty calories either. I would love to give you the exact calories but the package is long gone. The Iced Gingerbread has 250 calories. I would imagine the others would be about the same. And now my confession, I haven't tried the Iced Gingerbread yet but I know I will love it! I am saving it just a bit longer as these are treats or emergency snacking meals for me. And I am only calling them snacking meals since 250 calories is a bigger snack for me. I am so thankful for this opportunity and I am happy to know there are some yummy bars I can grab in a bind that don't contain dairy. Thank you Clif Bar! Daily Gratitude: I am thankful for the blessings in my life. Daily Affirmation: I have the power to step up to the plate and make a difference.